V.Gatsolaev was born in Nogkau, Irafsky district, North Ossetia. In 1934 he took a course in North Ossetian Pedagogical Institute, specializing in math and physics. But tough situation in Europe and oncoming threat of war made him change his profession. 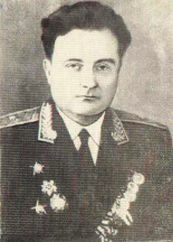 In 1941 he entered the Dzerzhinsky Military Academy. Soon, when Nazis invaded USSR, Gatsolaev went to the war and started his service at the Kalininsky Front. Then, during the next three years he participated in the bloody battles within the Western, North-Western, Voronezhsky and First Ukrainsky Fronts. In 1944 as an anti-aircraft battalion commander, major Gatsolaev participated in liberation of Ternopol. In that battle his battalion brought down 11 German aircrafts. Later on he also took part in battles for Krakow (Poland) and in Berlin Sector. V.Gatsolaev was honored with the Order of Red Banner and Order of Alexander Nevsky.